Mt. Meru is located in the heart of Arusha National Park and it is 50 miles west of Mt. Kilimanjaro. 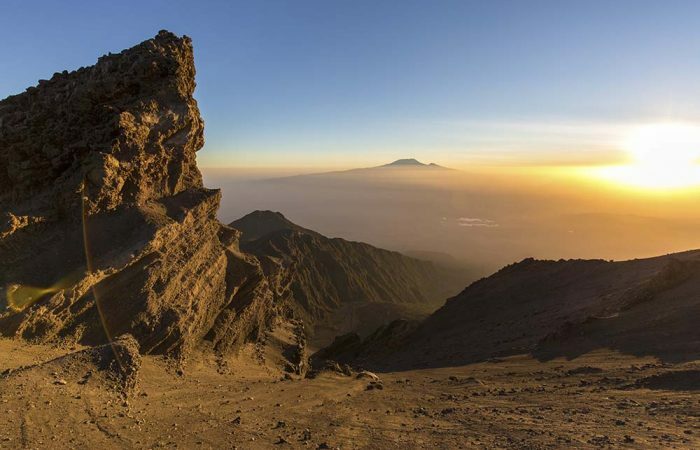 Mount Meru is a massive volcano reaching 14,980 feet (4,565 meters). This trek serves as an ideal warm up for Mt. Kilimanjaro due to its altitude acclimatization and hiking distances. This trek is also geared towards hikers that prefer less crowds and a challenging ascent. Hikers in Mount Meru must climb with an armed ranger due to the wide range of wildlife living on the mountain. On the lower slopes of the mountain, hikers are more likely to see elephants, giraffes, and buffalo! As hikers continue their ascents, the trail follows the north rim of the volcano’s crater along a dramatic ridge line. Throughout the climb, hikers sleep in designated huts along the trail. Hikers reach the summit as the sun is rising and they will have spectacular views of Mt. Kilimanjaro and of the Mt. Meru Crater. Climb Mount Meru can be accomplished in 3/4 days.